ALL carcasses are plywood construction ~ STANDARD! 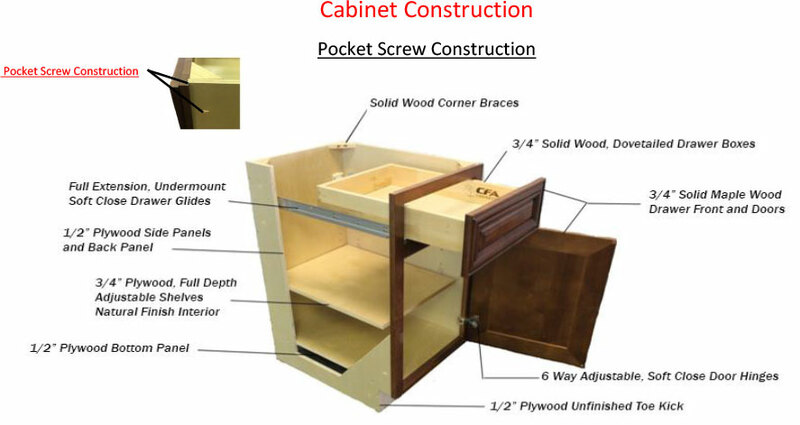 ALL drawer boxes are Dovetailed hard wood boxes (3/4" or 1/2") ~ STANDARD! ALL drawer glides are full-extension, soft close ~ STANDARD! * ALL door hinges are soft close ~ STANDARD! ALL face frames are 3/4" solid wood ~ STANDARD! ALL doors and drawer fronts are 3/4" ~ STANDARD! ALL hinges are Soft Close, Nickel Plated 6-Way adjustable, frame mounted ~ STANDARD! ALL shelves are 3/4" plywood (Veneered edges) ~ STANDARD! ALL exposed surfaces are UV Coated ~ STANDARD! ALL door & drawer fronts are full overlay ~ STANDARD! ALL wall cabinets are invertible ~ STANDARD!